If you would like to sign up for a class, please contact me. All classes are unavailable until further notice. We are moving, a.k.a. my kiln will be unavailable for use until we have moved and reinstalled new electrical units. Thanks for understanding! Feel free to contact me. I would love to hear from you! For gift cards, click here. Based out of my home in NW Fort Wayne, IN. I’m a follower of Jesus. I try to consider Him in every action I take. We’ve had a lot of adventures together with lots of funny and hard stories to tell. Some of them at the same time. I’m a wife. I’m married to my favorite person in the world, Aaron. He’s the one who tripled the length of my last name. He’s a steady, considerate man who is behind me and in front of me pulling me into the ceramics business. He’s intentional and watches out for me in every way. I’m a mom. My daughter, Eddie, was born in March 2017. I have brown hair and brown eyes. She has blonde hair and blue eyes. I don’t know what that’s about, but she’s adorable. I’m an artist. I never thought that would be a statement that earned me anything, but it has been true of me since I could hold a pencil. God’s still showing me what being an artist looks like in building relationships and becoming more the person He wants me to be. I love making bold, simple, beautiful pieces that everyone can appreciate. I’m a teacher. I have an art education degree from IPFW. I taught in Kigali, Rwanda for a year, K-12, and at Central Christian in Fort Wayne for a year and a half. I love teaching and making art enjoyable and less intimidating for everyone. Some of my favorite moments have been seeing students, who compare themselves to others, begin to do their best and see improvement. It lets me know that I’m doing my job well. Contact me if there’s a class you’d like but is not listed. I am also open to hosting events like bachelorette parties, bridal showers, birthday parties, etc. Events may cost extra depending on food, traveling, etc. All classes, unless otherwise noted, take place at my home in NW Fort Wayne, IN. Individual Pottery Wheel Lessons are also available ($20/hour). Contact me for more information or to schedule one! Make memories together! People of all ages can personalize their own ceramic ornaments using glazes. Choose from stars, doves, reindeer, snowmen, houses, gingerbread men, gloves, stockings, trees, Santa and more! Choose your own colors and designs. Pre-painted ornaments will be around for examples and inspiration. 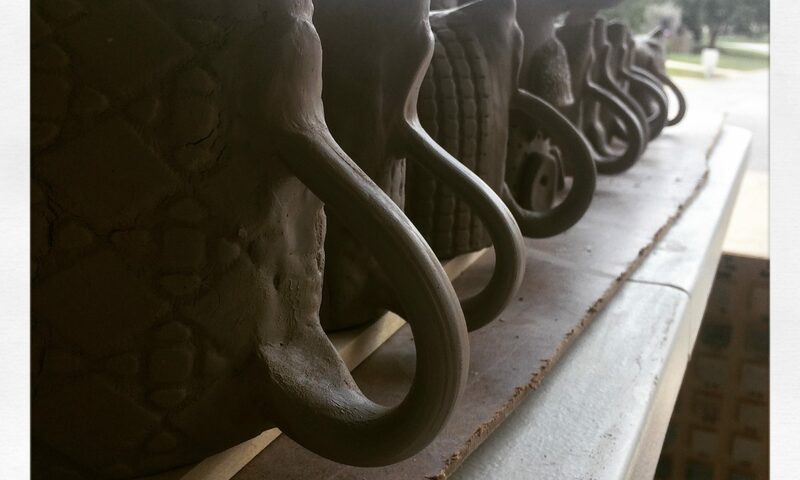 Looking for a fun, easy introduction to clay? This simple class gives you the chance to make 4 dessert plates. You’ll learn how to roll a slab, press in texture, and form plates over a mold. You then choose a glaze which will be applied for you! Pieces will be ready to pick up 2 weeks after class. Relax by having some wine with friends and making succulent holders together! You have a choice between flat-backed and hanging holders. During this 3 hours class, you can make a set of 3! Need a low-expectation, fun, zany, and unique experience with friends? This fun, low-stress class will teach you how to make your own slab-built monster! You’ll learn how to roll a slab, attach clay, and apply glazes. The first session will be spent forming the monster out of clay. The second will be applying glazes. All materials are provided, you just need to wear clothes that could get dirty! Pieces will be ready to pick up 1 week after 2nd session. Sarah from The Land Before Time, bobble-head edition. In the first session , we form the head and body out of clay. In the second, we glaze, or paint, the body. I provide all materials. The only thing you need to bring is an idea of a character or object you’d like to make, and clothes that may get messy! Pieces will be ready to pick up 1 week after the 2nd session. Looking for a hand-made piece for your home? These mobiles will add a splash of color and fun to any room! An easy, but difficult class. These mobiles are easy in clay design and use, but can be difficult in designing and putting together. Each participant MUST come prepared with an idea of what you would like to do. If you need ideas, talk to me and we’ll figure it out together. Each piece can be as easy or difficult as you make it! 1st session will be cutting out pre-prepared design from paper and clay. 2nd will be glazing each individual piece. 3rd will be assembling mobiles from glazed pieces. Pieces will be ready at end of 3rd class.